Are there Sheetz stations where you live? If so, count your blessings. If not, I feel your pain. Sheetz truly is a one-stop shop (and no, they aren't giving me any swag to say these things)--you can fill up on gas, coffee, typical convenience store conveniences, and food. Not just any food, mind you, but tasty, hot, reasonably-priced, made-to-order food. Sad news, folks--I've been Sheetz-less for the last two years. The stores just don't have a presence in NY--apparently they're limited to Pennsylvania, Virginia, Maryland, West Virginia, Ohio, and North Carolina. That said, I had forgotten how magnificent the big red shops could be. On a recent road trip, I found myself without many food options. I was filled with glee and anticipation upon seeing the Sheetz logo on an exit sign and promptly pulled in. I was not disappointed. I ordered a shmiscuit. Come on. How can you not love a place that has shmiscuits. And shmagels. And shmuffins. That's just fun stuff. Anyway, my shmiscuit met all of my specifications and I was completely sated. Since eating that shmiscuit, I've felt the need to recreate it at home many times. The method is simple: Bake and split biscuit. Apply cheese (pepper jack, of course), cilantro, salt, pepper, and meat (I chose turkey) as needed. Return to oven until cheese melts and meat is heated through. Consume. Di. Vine. Bring on the day! Satisfy my curiosity (and give me some new ideas)--what do you like on your breakfast shandwiches? THey had these when I was in P.A. but i never had the sandwich. How fun and exciting to find a "one stop" on your trip! I have never been to Sheetz but I know what I travel I will look for one. This looks quite tasty! Never heard of Sheetz before, but close enough to PA, I will now be on the lookout for them. The sandwich looks like a delicious way to start any morning - yum! I've never heard of Sheetz but I wish I had! Although I live in what most people consider to be the country of delicious cheese, the only one I really love is pepperjack. Melted pepperjack on a biscuit couldn't make my day anything less than amazing, I bet. Wow--never heard of Sheetz. But, I like the idea of a breakfast sandwich. Being married to a southerner, I'm partial to biscuits and ham. Well, I've never heard of Sheetz, but I love breakfast sandwiches. My favorite would include bacon, or sausage, with an egg and some pepperjack, please! Oh yes, on a nice flaky biscuit. Divine! I want a shmiscuit right now. I don't do breakfast sandwiches much but when I do I make an open faced over easy egg on top of toast with bacon or sausage under the egg. Excellent! I have never heard of Sheetz, but your sandwiches look great! nope, me either. but glad you told me about them! Mmm...I'd love a schmiscuit! I'm addicted to sausage Mcgriddles. Sad but true. I usually like schmeese, shegg, & schmacon on my breakfast schandwiches. How can something as simple as turkey and cheese look so wonderful? Now I'm craving lunch! I'm jealous! Love the name, and it sounds like a great place or like great places. Gorgeous biscuit too! I like an egg and cheese breakfast sandwich with a little smoked salmon sometimes. Hey wanted to tell you that there are more eps on the dvd of Kitchen Confidential, I think 5 or so. And I think maybe that is where that quote is from, sadly. Because I saw the broadcast eps twice, and I don't think I saw the brunch ep twice, so I think it was one of those. You should rent it or watch on Hulu or whatever. :) Of course it will also make you bitter. 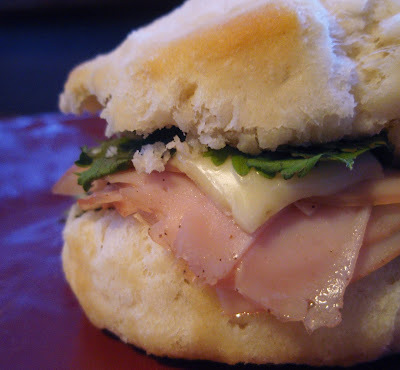 My favorite way to use left over asparagus is to make breakfast biscuits with it: aparagus, pan-fried ham, and a mild and soft white cheese or hollandiase (usually I will only it if I have company over. Even a 1 egg sauce is too much for 2 people). It's the same bake, split, lightly butter the biscuit, add insides and bake method, but they are sooo yummy! OOps! Forgot the egg! Poach an egg and add it when you remove it from the oven. I've never heard of Sheetz! I'm in Virginia so I will look to see if there's one around me! I must make a smiscuit right away! No Sheetz around here I regret to say. However, anything on a biscuit is right up my alley. When I'm on the road I love stopping at Cracker Barrel and having their biscuits-which I invariably top with bacon and an egg! Are you sure that restaurant wasn't invented by Rachael Ray - I swear she's the inventor of all food names like that. I definitely need to recreate the almighty shmiscuit at home. I'm a sucker for ham, egg and swiss on my breakfast sammies. Never heard of Sheetz but you made me long for Wawa- another PA based one stop market that cooks hot food to order and has the BEST fresh brewed coffee around. Oh how I miss the east coast! I have never heard of a Sheetz, but i'm gonna look out for one if I ever head that direction. Oh my, that looks so so good! I've never eaten at a Sheetz, but I may have to now when hubby and I visit family in Virginia. And now I'm hungry again :-). No Sheetz here...too bad..guess I'll have to make my own schmiscuits! Sheetz isn't on the west coast. Here you get a breakfast burrito...eggs, bacon, cheese, salsa or anything you want, wrapped up in a flour tortilla and toasted on the grill. No Sheetz where I live but I could probably scare up a biscuit, if I had to, to make the at-home version. I could use one right now. It looks wonderful. I am not familiar with Sheetz, but this incredible looking biscuit sandwich is awesome. I could definitely eat a few of these. No Sheetz here... the biscuit looks fab! Can I tell you how badly I wish I lived near one of these? Really, I long to ask for a shmiscuit. I guess I've never lived in a State that had Sheetz. They certainly don't exist out here in California, nor did they in NY or Texas. I LOVE the shmiscuit! My mouth is so watering right now. Breakfast is my favorite meal and I can eat breakfast food ANY time of the day or night. If I made a shmiscuit to my liking without worrying about calorie intake, it would probably be full of crispy bacon, a fried egg, or two, cheddar cheese and maybe even some avocado or tomato! Does this count as a breakfast sammie? One of my fave things is a crepe stuffed with ham, melted cheese and scrambled eggs. Watching the Olympics makes me think of that because there's a place on Robson Street in Vancouver, where I used to so indulge. I have definitely never heard of Sheetz, but I can relate to that longing of missing random foodstuffs that you can't get anywhere near where you live now. Yeah, hope that makes sense. One of my favorite ridiculous pasttimes is to start words with schm-. Schmobviously is my favorite. I would very much like to try a schmiscuit one day. Schmobviously. Well, darn, I live on the wrong corner of Ohio. Your schmiscuit looks DI Vine. Now all you have to do is teach me/us how to make a biscuit, LOL. Aren't they in the middle of the toll road- interstates? A long time since I've been on the roads in PA. With a name like that--how could I forget? Usually fly and have been to Wawa for some good food in PHL. Did stop at one in MD 3 years ago on my way to DC in a carpool and she stopped. We ate--also had UTZ potato chips. Here in ATL, it is Chick fil A --three meals a day. I like mine with mayonnaise for breakfast or lunch. Or, McD Egg McMuffin--home made. I do love the name schmiscuit! That does look divine. Heck, I wouldn't know Sheetz from Shinola. (sorry). Seriously, I've never heard of them, and I used to be all over that area. Maybe they're new since I left? In any case, that looks like an awesome biscuit! That's a ridiculously cute and silly name for a breakfast sandwich! You know, I don't really eat breakfast sandwiches. Just not something that occurs to me to do. Eggs over easy on toast is about as close to a breakfast sandwich as I get. Yours looks delish though. I've never heard of this but, it looks delicious! Holy Sheetz this place sounds yummy! My kids are Sheetz addicts. When my sons bring sandwiches home to reheat, my hubby delights in sneaking over to the microwave and taking a giant bite out of the sandwich, leaving the purchaser unsure whether to laugh at Dad or sputter in fury. UTZ POTATO CHIPS ARE THE BEST!!! I like ham, egg and swiss cheese in my breakfast sandwich. I need to make these for my hubby as he loves all sorts of breakfast sammies. I just can't seem to swallow this stuff early in the morning, but then I am not a breakfast fan to begin with. I should make them for dinner instead. I'm an oddball and don't order biscuits. LOL, generally I don't like my food to touch. Haha we have Sheetz in NC but you know, I don't think I've ever eaten there. I sure need to give it a try though! No sheetz in Sydney, nor Manila... for me breakfast sandwich is usually a ham and sheese - oops I mean cheese! Holy Sheetz! HaHa...being from the great white North, I've never heard of them either. Gotta love the name, though! Pepper Jack cheese is my all time favorite. I even top my pizza with it. Do they have Shmeetza? Your biscuits look fabulous. I live in Virginia and have never heard of Sheetz! What a shame - this looks and sounds completely satisfying. As for a favorite breakfast sandwich, my husband ordered a blueberry bagel at a local shop topped with the perennial bacon, egg and cheese, and we've found it to be a keeper - something about the sweet salty combination. I am enjoying your blog! Yummy, wish I could get a shmiscuit!! Sheez Louise that looks good. We don't have them here in SC but I certainly keep a watchful eye when traveling from now on. I am NY too so no Sheetz... I love the sound of a schmagel! never heard of it but I sure would love a bite!! yum! Well the name is not as cute but every time I go to Sheetz I get the Pretzel Melt. Sometimes I get the breakfast version and sometimes the lunch version but either way, I could eat my weight in their pretzel rolls. Their onion rings are yummy too. For a breakfast sandwich there must be cheese and I usually go with bacon and eggs with a touch of mayo. While Sheetz is great you should have Wawa where you live right? They make the best Italian Hoagies at least they do in NJ. Best midnight run around. I like sausage and grape jelly biscuit from McD's- totally gross I know but they seemed to hit many spots back in my night-shift nursing days! I've never heard of Sheetz, but now I feel like I'm missing out! There was an article/discussion of Sheetz in the Washington Post, and I read and noted it, but I didn't feel compelled to seek a Sheetz out. Your post, though, has made me rethink my position. I need to visit a Sheetz soon! I might just have to take a road trip . . . thanks for the heads up. That sandwich looks ah-mazing! Living in western PA, I am well aware of the joys that are Sheetz. I too love their breakfast sandwiches and often find myself having one for lunch.